Shri Ramesh Ranganathan, Acting Chief Justice of High Court of Judicature at Hyderabad and the Chancellor. Prof. Faizan Mustafa, the Vice Chancellor. Esteemed Members of the Governing Bodies of the University, Eminent Faculty, Dear Guests, Parents and Graduating Students. 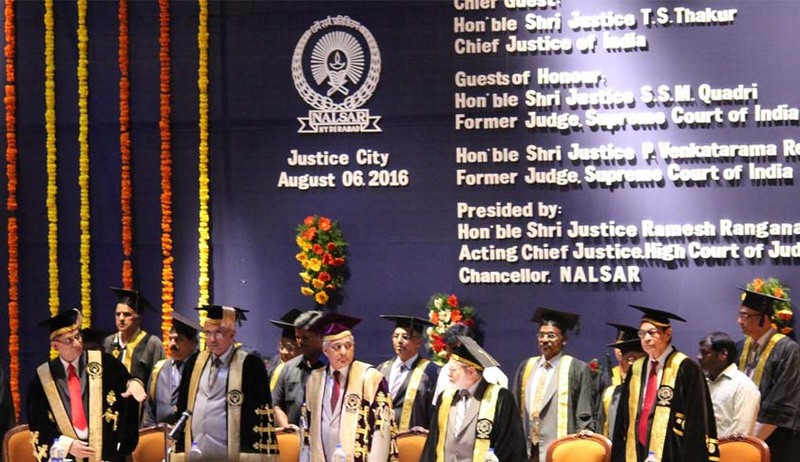 I am extremely happy to have been invited to deliver the Fourteenth Annual Convocation Address of the NALSAR University of Law, Hyderabad. Convocations are solemn occasions for the University and the graduating students alike. It is an occasion which is celebrated by the teachers and the taught as much as by the University and the parents. I would add a special word of congratulation to those who have been adjudged worthy of receiving awards and medals for their outstanding performance. I would also take this opportunity to extend my greetings to the proud parents who treasure the memories of this day. A Convocation Address on an occasion like this is often used to reflect on some subtle thought or higher value of life that is driving force for the success of an individual or society. I propose to talk to you about the constitutional vision of an ‘Inclusive India’ and our efforts to architect a just and inclusive society, which ensures an equal participation of all sections and groups in the governance of our economy and polity and in the fruits of social and economic development in the country. Indian Constitution which enshrines the values of liberty, equality and fraternity is thus a unique testament that recognises the above values avowed objective placed at the top of the normative pyramid. It determines its commitments and orientations. It echoes the past, lays the foundation for the present and determines how the future will look. It is philosophy, politics, society, and law combined together for making a just and inclusive society. The world Summit for Social Development (March 1995), established the concept of social integration to create an inclusive society, “a society for all” as one of the key goals of social development. Following this, significant policy commitments were made in the Millennium Declaration (2000) which subsumes social integration in its synthesis of peace, security, development, human rights and further embodies social inclusion principles as well as the objectives and goals set out by international community in previous UN Conferences. How to make the concept of a just and inclusive society operational, in the face of resistance to change is the question. It is a formidable challenge for policy makers and social scientists to find ways and means to promote an inspirational yet realistic set of policy measures geared towards a “society for all”. This requires a paradigm shift so as to recognize the dignity, value and importance of each individual, not only as a moral imperative, but also as a legal principle, a societal goal and eventually, a practice. No human being should be fated to undergo a miserable life as a result of his or her class, country, religious affiliation, ethnic background or gender. Protection in terms of upholding human rights, and accountability in terms of upholding the rule of law are conditions precedent for a just and inclusive society. These projected goals entail a legislative frameworks-backed by international law standards and informed by public engagement; competent, inclusive, accountable and transparent institutions to implement the laws; accessible, fair and transparent dispute-resolution mechanisms and vigilant and empowered civil society to claim its rights to resources and services and to demand accountability of those responsible for the execution. Amongst all the stakeholders of legal system, Judiciary, being the guardian of fundamental rights, has internalized its obligation and has played a prodigious role in ensuring just and inclusive society—whether it be—human rights which include right to shelter, social security, right to adequate nutrition, clothing; gender justice; education, protection of minorities and more prominently limits on the powers of the Parliament and governments to meddle with the basic tenets of the Constitution. Justices may occasionally fail to do so but failing systematically to translate high judicial power into a fiduciary power (as a form of social trust), would fade the very idea of constitutional India. The Supreme Court not merely liberalized the concept of standing but drastically democratized it. No longer is it important to show that one’s fundamental rights are affected to move the Supreme Court or the High Courts, but it remains adequate to show that one argues for the violations of the worst-off Indian citizens and persons within India’s jurisdiction. Concern for human rights has provoked a creative partnership between active citizens and the judiciary. Constitutional secularism provides to all citizens an equal right to freedom of religious belief and practice. Indian judiciary over the years, has construed non-discrimination on the grounds of ‘untouchability’ as inclusive of right to access to the sanctum sanctorum in places of worship. Having said that we cannot forget that India had an acrimonious historical past as far as its marginalized classes are concerned. The SCs, STs or OBCs are not able to get out of the manacles of the past. In furtherance of constitutional vision of equality before law compatible with equal opportunity of access and outcome, the judiciary in India has contributed evocatively to ensure that the imperceptible marginalized classes of our society are included in the ornate landscape of the mainstream socio-political matrix of the country. While upholding the protective discrimination constitutionally valid, this court fixed the numerical quotas for access to education and state employment, not just for the SCs, STs and but also for socially and educationally backward classes and ‘other backward classes.’ The Supreme Court has also found it essential both to limit the overall quotas to no more than 50% and to gradually eliminate the creamy layers in order to sustain the efficiency of administration. Indian judiciary has not confined its shielding umbrella to its citizens only but it has extended constitutional protection of life and liberty to non-citizens as well. The Supreme Court in State of Arunachal Pradesh v. Khudiram Chakma [1994 Supp. (1) SCC 615] held that protection of Art. 14 and Art. 21 encompasses extra-terrestrials too within its purview. This Court restrained the forcible expulsion of Chakma refugees from the state and directed the state government to ensure that the Chakmas situated in its territory are not ousted by any coercive action that is not in accordance with the law. And any attempt to forcibly evict or drive them out of the state by organized groups should be repelled by using paramilitary or police force. This decision of Supreme Court is noteworthy considering the fact that India is not a party to International Convention on the Status of Refugees. I am glad to learn that NALSAR University is under the dynamic leadership of its spirited Vice-Chancellor, Prof. Faizan Mustafa, making efforts to diversify the curriculum by offering more electives which allow students to delve deep into specialized topics with faculty members who are at the forefront of innovation in their fields. NALSAR’s innovative MBA programmes in Court Management and Sustainability Management and post-graduate degrees in Aviation and Telecommunication Laws will be a motivation for other law universities to make similar innovations. I congratulate the Vice-Chancellor and all the eminent faculty members for their commitment and hard work. Finally, I would like to advice all graduating students before you leave this prestigious institution that, legal profession is indisputably great but not swift. The Gandhian dream of Self- Rule and Antyodaya can be attained only when the life of the last person in the society is also touched. The Father of the Nation, used to say in his morning prayer: 'O God! Enable me in taking first step in right direction, the rest will follow.